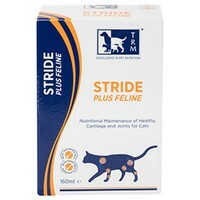 Stride Plus Hyaluronic Acid is a new generation mobility supplement for cats. It is used for the nutritional maintenance of healthy cartilage and joints. Daily feeding of this fast acting solution will assist in the maintenance of joint mobility. Mix STRIDE Plus Hyaluronic Acid well into the feed. Feed each cat individually. The dosing pump attached to this container dispenses 1.25 ml. We have two 19 year old cats both with arthritis. The one with the worse problems had been on a full dose of Metacam which had served its purpose well. However, after having been diagnosed with lymphoma and subsequently put on steroids which cannot be taken with metacam, although her lymphoma symptoms were much improved,she was somewhat miserable with pain. Being a bit dubious, we thought we would give this a try. Fantastic, she is so much better, even than when she was on just metacam. (Remember though she has anti-inflammatory / analgesic effect from the steroids too). She now jumps onto stools again, will use the cat flap if she has to and has run up the stairs and run in the garden just because she can again. With metacam or steroids alone, she was unable to do this. One cat may be a fluke, but our second cat has seen similar success and is now able to jump on to the shed roof and make her way up to our dormer roof like she used to. She has been able to reduce her level of Metacam, but remains on both. One note, when dispensing this solution, hold the container horizontally to get the correct dose or you will be left with a mess and greatly differing dosage each time. Also, both cats wouldn't eat a full dose in their food, so we have resulted in decanting some into another container and using a 1ml syringe to dispense smaller doses, as they eat through the day, up to the required level. They eat this with no problems. Overall, impressed how we saw a difference within the first week, and continue to see great results. Wife so impressed, she has started to take a supplement with the same ingredients to see if they have the same effect on her neck! !